The Monk Avramii (Abraham), Archimandrite of Rostov, in the world Averkii, in his youth left from his parental home and entered upon the path of Christian asceticism. Having assumed the monastic form, Avramii settled at Rostov on the shore of Lake Nero. In the Rostov lands there were then yet many pagans, and the monk worked intensely at spreading the true faith. Not far off from the cell of the Saint there was a pagan temple, where the pagans worshipped a stone idol of Veles (Volos), which caused fright among the inhabitants of Rostov. In a miraculous vision the Apostle John the Theologian came to stand before Avramii, and gave him a staff crowned with a cross atop, with which the monk destroyed the idol. At the place of the pagan temple, Saint Avramii founded a monastery in honour of the Theophany and became its head. And in memory of the miraculous appearance, the monk erected a church in the name of the Apostle John the Theologian. Many of the pagans were persuaded and baptised by Saint Avramii. Particularly great was his influence with the children: he taught them reading and writing, he instructed them in the law of God, and tonsured monastics from amongst them. Everyone coming to the monastery of the saint was lovingly accepted. His life was a constant work of prayer and toil for the benefit of the brethren: he chopped firewood for the oven, he laundered the monks clothing and carried water for the kitchen. The monk reposed in old age and was buried in the church of the Theophany (+ XI Century). 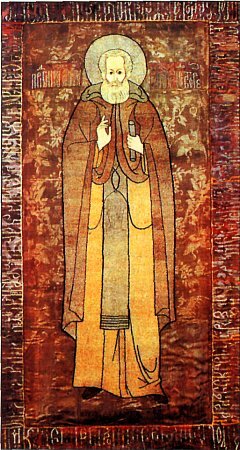 His holy relics were uncovered during the time of Greatprince Vsevolod (1176-1212). In the year 1551 tsar Ivan the Terrible, before his campaign against Kazan, made the rounds of holy places. At the Theophany-Avramiev monastery the showed him that staff, with which the Monk Avramii had destroyed the idol of Veles. The tsar took the staff with him on the campaign, but the cross remained at the monastery. And returning again after the subjugation of the Kazan khanate, Ivan the Terrible gave orders to build at the Avramiev monastery a new stone church in honour of the Theophany, with four chapels, and he sent there books and icons.